Is it time for some change in your garden? I think it is time for some change in my garden. 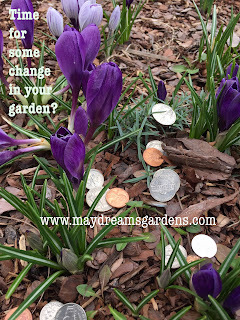 In the meantime, look at all the change I've already found in my garden! I hope some poor garden fairy isn't wondering how his/her treasure disappeared ! Too cute yet most creatively conceived! Looking forward to your future endeavors! I will be interested to see what kind of changes you make. No doubt you will need a lot of change to make change$. So cute! I just found your blog. Love it! Fun post Carol...love your writing and sense of humor! So Carol, did you leave that as a tip for the fairies watching over your garden this winter or did the fairies leave it for you? You don't suppose that a dog finally caught a pesky leprechaun and this is all that's left?